Charleston Voice: > Report: FBI Visiting Gun Shops to Investigate "People Talking About Big Government"
> Report: FBI Visiting Gun Shops to Investigate "People Talking About Big Government"
While there’s little chance of verifying the story since the FBI would almost certainly deny the claim, the notion of FBI agents charactering innocuous activity as a potential indication of terrorism is firmly established in the federal agency’s own literature and training procedures. The FBI has also repeatedly labeled those who identify as “sovereign citizens” to be domestic terrorists. In 2012, we reported on how the FBI’s Communities Against Terrorism (CAT) program was instructing businesses that banal activities conducted by millions of Americans on a daily basis were potential indications of terrorist activity. Flyers for the program being handed out to businesses such as Internet cafes even listed paying for a cup of coffee with cash as a suspicious activity. A flyer aimed at Military Surplus stores also encourages owners to report people who “make bulk purchases of items to include….meals ready to eat”. In total, there are 25 different CAT flyers aimed at businesses from across the spectrum – everything from hobby shops to tattoo parlors. 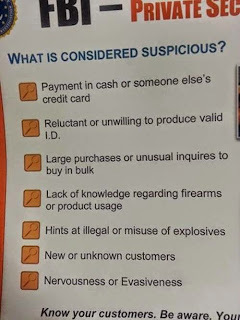 The flyer pictured above which was reportedly handed to the gun store worker by the FBI agent contains very similar language to that used in flyers produced for the FBI’s Communities Against Terrorism program.